A crop of fantastic children's books released today by innovative publishers Tiny Owl - Definitely something for everyone! Today is a big release day for Tiny Owl Publishing, champions of fantastic diverse stories from around the world. Their new collection for 2017 truly does have something for everyone so we'll dip into our book bag and take a closer look. "When I Coloured In The World" is a brilliant little story about a little girl who is gifted some amazing crayons, and sets about using them to change good things into bad. Her lyrical descriptions of each colour - and what she will use it for - are scintillating and lovely. She turns drought into rain, sadness into hope and deftly weaves a colourful journey as she goes. 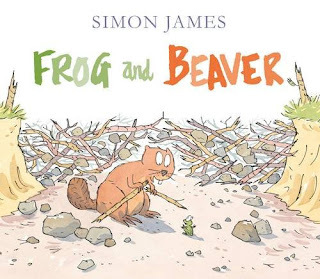 We read this one out loud - particularly enjoying the simple central theme but also the gorgeous exploration of colour and turning bad things around into good. 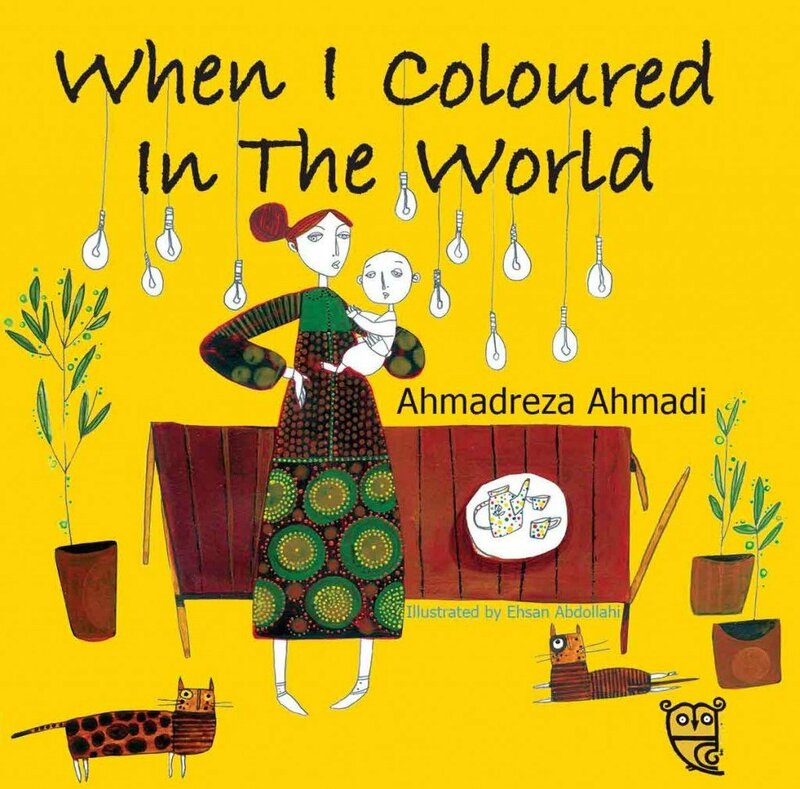 "When I coloured In The World" by Ahmadreza Ahmadi and Ehsan Abdollahi is released today by Tiny Owl. 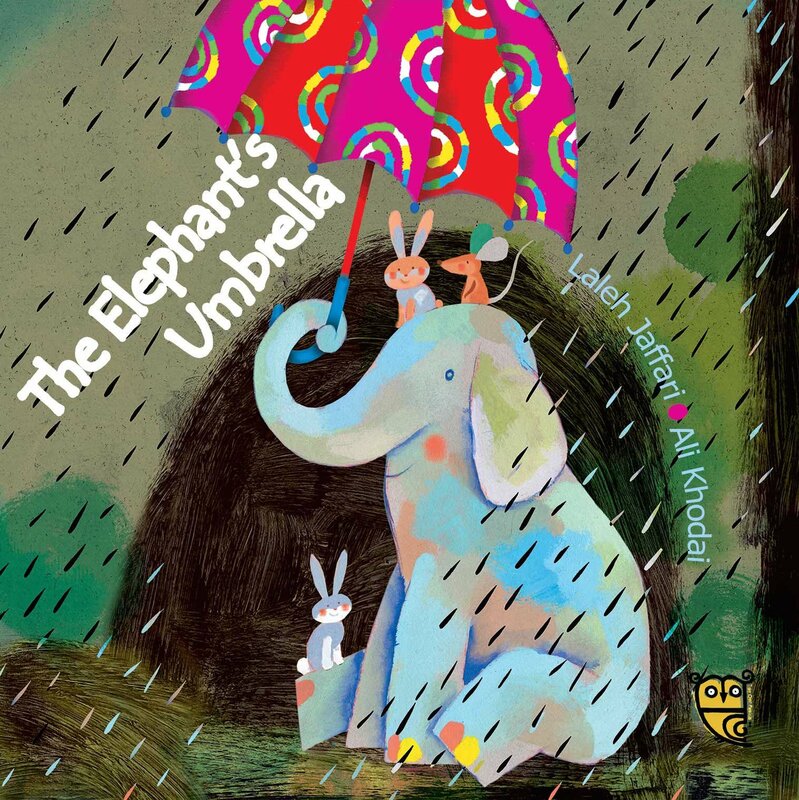 "The Elephant's Umbrella" is a short but sweet book all about a happy elephant who owns the most amazing colourful umbrella. One day during a storm, the umbrella is whipped away by the wind - landing near a leopard who wants the umbrella all to himself. But the umbrella doesn't like leopard's way of living and his ideas of what he'd use the umbrella for. Whipped away again, the umbrella lands near bear - whose ideas are probably even worse than leopard's! Umbrella soon begins to miss her old friend - will the wind return her to her rightful owner one day? Beautifully written and illustrated, a gorgeous moral tale that will keep little ones entertained. "The Elephant's Umbrella" by Laleh Jaffari and Ali Khodai is released today, published by Tiny Owl. 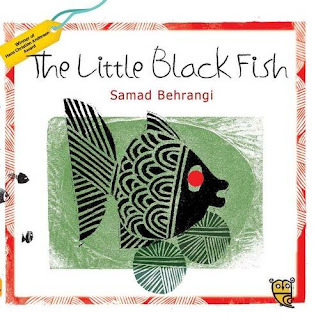 "The Little Black Fish" by Samad Behrangi tells the story of an inquisitive little fishy fellow. Little Black Fish may be small, but he has big questions and a determination to find answers to them. While his fellow fish are too scared to do anything different from their set routine, Little Black Fish swims over the edge of the pool, into the stream and river which will show him much more of the world. He meets wonders and adventures, dangers and beauty. He makes it all the way to the sea, and finds his answers. The little fish's story is passed down to a new generation who will hopefully be inspired by his curiosity and joie de vivre. "The Little Black Fish" by Samad Behrangi is out today, published by Tiny Owl. Phew, room for one more? I think so! 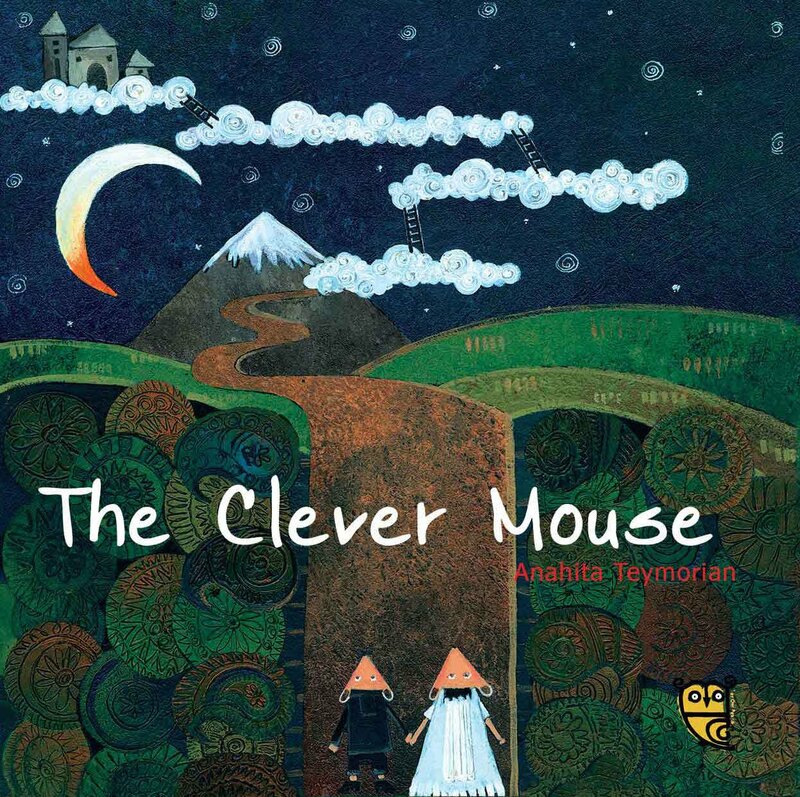 Last but not least it's "The Clever Mouse" by Anahita Teymorian. The story of a mouse who is indeed clever, but also a bit too big for his (tiny) boots. Clever mouse always believes his way is the right way, but a bit of realising his own foolishness teaches him what he needs to learn in order to become wise and happy. A mousy love story that shows how kindness is more important than beauty, and that sometimes a good dose of humility goes a very long way. "The Clever Mouse" by Anahita Teymorian is also released today, published by Tiny Owl. 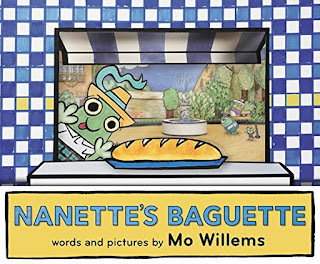 A truly brilliant range of fantastic titles, visit the Tiny Owl website for more exciting and diverse children's stories from a publisher who really knows how to stand out from the crowd. (All books kindly sent for review). Faster than a speeding bullet, able to leap tall buildings in a single bound. 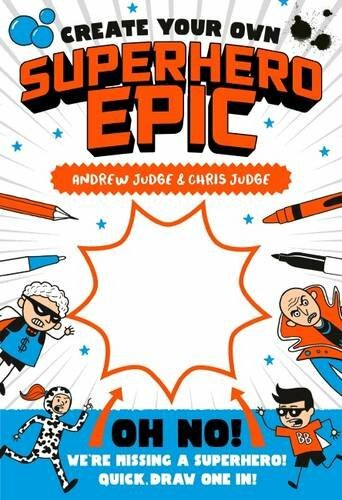 Depicting the most frenetic superhero adventures with a deft flick of your pen, pencil or crayon! 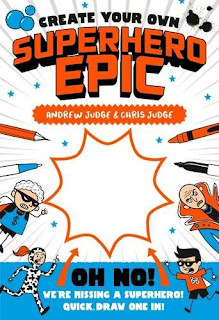 Join in with "Create your own Superhero Epic" by Andrew and Chris Judge! We could all do with a bit of extra luck in our lives, right? 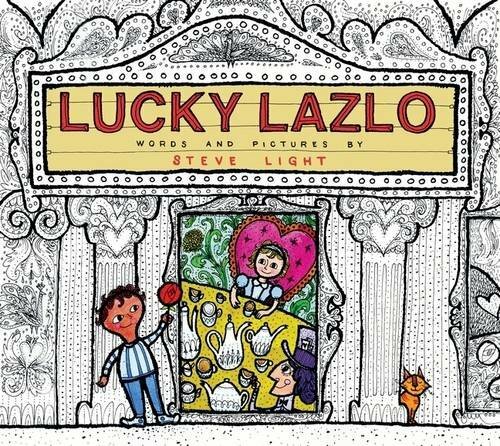 Steve Light, creator of some of our favourite children's books is back for 2017 with a new picture book revolving around an endearing fellow called Lazlo. He's going to see the girl of his dreams, starring at the local theatre in their production of "Alice in Wonderland" and like the thoughtful chap he is, he decides to pick up a single red rose to give to her on her opening night. Lazlo's luck runs out however, when he meets a mischievous cat who runs off with the rose, and leads poor Lazlo on a hectic chase through the theatre and onto the stage just as things are getting under way. Will that pesky cat get his comeuppance? Will Lazlo rescue the rose to give to his lady love? Weirdly, we usually give Steve's books plenty of praise and attention on the blog but for some reason this one just didn't work for either of us. I adore Steve's artwork, and the chase story is fine but it's lacking something - I really can't explain what it us but neither Charlotte nor I could shake the feeling that we'd seen this before somewhere. We dug deep into the archives and found that it was very similar to Harriet Ziefert and Jenni Desmond's excellent "Backstage Cat".. 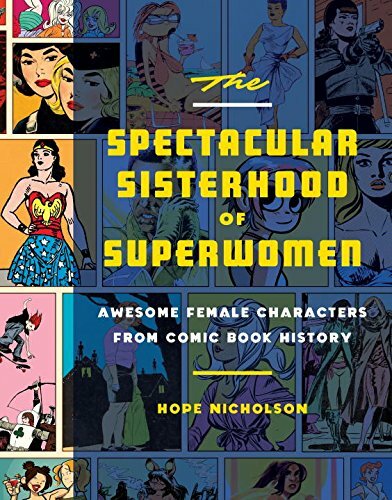 There was a lot to like about this book despite that slightly deflated feeling that this wasn't as great as "Zephyr Takes Flight" (A book we've talked about and adored so many times on this blog) and the equally fab "Swap" (which felt fun and original). We do love the artwork, a mix of fab detailed monochrome line drawings with gorgeous splashes of colour. Lazlo is a great little character but this one just didn't really work for either of us. 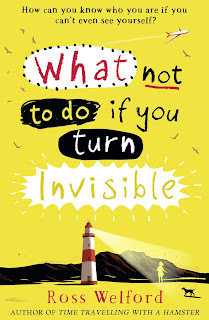 Perhaps you'll enjoy it more, as it's a delightful little book for younger readers who love a hectic chase. 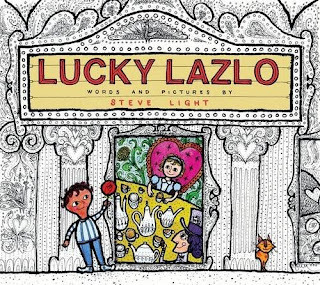 "Lucky Lazlo" by Steve Light is out now, published by Walker Books (kindly supplied for review). 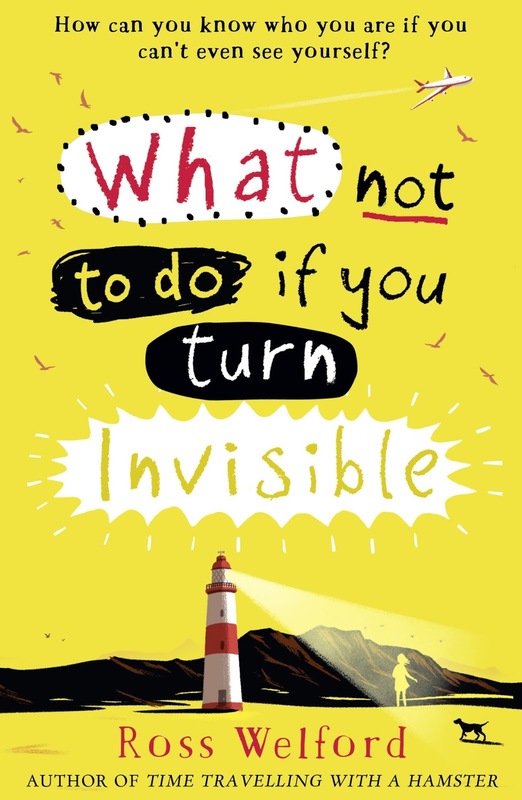 This week's Chapter Book of the Week is a hugely entertaining "What if" book that embraces a dream that most of us will have at some point in our lives...what if you could turn invisible? Wow! This is a distinctly different "Book of the Week" winner..never judge a book by its cover! Parenting 101 - What happened to common sense? A ReadItTorial. Common Sense. What does it even mean any more in a world where once again on the way into work I listened intently to another spokesperson for a nationwide campaign aiming to 'better inform' parents about good diets, wellbeing and physical exercise for their kids to avoid them sliding down the slippery path into childhood obesity, behavioural disorders and generally being horrid little swines. This week's ReadItTorial is in fact partially inspired by a number of topics equally. One is a recent 'dietary project' that Charlotte was working on in school. I should say from the outset that I don't want this to turn into another one of those horrid "smug parent" blog posts where we can comfortably claim we're amazing and do everything right - far from it. But when it comes to food, we've always taken an approach that goes beyond the usual '5-a-day' litany and further towards considering how we structure our weekly shop to achieve the best balance of proteins, carbs and of course fruit and veg in our meal plans. Both my wife and I are vegetarians - and this is something that REALLY bakes my noodle. We've always been the sort of vegetarians who quietly get on with it, not shouting from the rooftops about how much healthier we are than you carnivores. We make no bones about the fact that I'm vegetarian because I have to be (I'm actually allergic to most meat, violently so in the case of chicken which can really mess me up if I even touch the stuff let alone eat it). My wife just plain doesn't like the taste of meat but technically could eat it if she really had to. She doesn't choose to 'go veggie' through any conscientious love of animals or even from the perspective of trying to save the planet. Purely because she doesn't like eating meat. So poor Charlotte has a diet that is largely vegetarian until we go out to dinner, or she visits with grandparents or relatives where she can eat what they're eating. Always with an eye on fat content, amounts (plate size, the current buzzword, how many times have you over-stuffed your child's plate because you mistakenly believe they need 'building up') and other factors. The way we plan out our meals and food intake just 'happened' - there was no consulting a health guru, no visiting YouTube for whatever brightly pretty so-called life expert is advising you to do this week. Very little attention to campaigns where you read their advice and it feels like your maiden aunt talking down to you (and the diet plans look like something from a 1970s healthy eating book). We just considered it to be part of parenting, a huge amount of trial and error - and of course a constantly shifting set of tastes and preferences with our daughter - surely we can't be the only ones who never went anywhere near the processed and frozen food aisles when considering feeding our child? Even for convenience or economical reasons (and let's face it, processed food is not as cheap as a bag of carrots and a couple of potatoes and maybe some greens). The whole 'physical exercise' thing too - that's something I just do not get. It's obviously not easy for everyone to get out there into the big wide world and explore but we never considered any other way of living, in fact we cannot stand being housebound at the weekend even on rainy days (yes we're likely to be the ones you see trudging along in the mud, soaking wet in our rain gear but loving every minute of it). Again we're back to common sense. You move more, your muscles work harder, you feel better in yourself and you don't vegetate and put on weight. We didn't need a famous celebrity to show us the way (and honestly, if you really believe you too can look like a twiglet after just listlessly moving your arms in front of the telly a couple of times a week, you really aren't ever going to get anywhere). Sometimes I wonder whether the world will evolve into a society where people have to be led by the nose in ALL aspects of their lives. The healthy / sensible eating thing always seems to fall on deaf ears until some new campaign or other hits the press, and kicks off (always temporary) interest for some folk who just can't do without any form of guidance, no matter who's pushing it. Relate this to the whole literacy thing. Again it's always felt like the natural thing to do, to ensure there are books around to read, for us to read to Charlotte, to guide and encourage (not push and force) her own early steps in reading on her own - and yet we still hear news that 10% of British households do not have a single book at home (I just cannot wrap my head around that figure at all). Fair enough that, again, there may be economic reasons why parents don't buy books for their kids, and it's becoming increasingly less important for the current government to bother properly funding public or school libraries (which just seems horribly chilling when you see large communities being robbed of their own libraries despite huge protests). Projects such as Bookstart / Booktrust aim to put more books in children's hands from an early age and though this tails off as soon as they start junior school, there are still opportunities to ensure that reading isn't a chore for your child but becomes a lifelong passion. There is only one agent for change - you, as parents or guardians. You have to start the ball rolling yourself. By all means find out more on the internet, take a look at the government and nationwide campaigns that can help you at least get a start in making a few important lifestyle changes but most of all, tap into your common sense and do what you feel is right for you, not just something that'll let you comfortably tick a few boxes in some throwaway good parenting guide. Welcome, welcome to another year's worth of fantastic monthly chapter book roundups. Once again we'll be bringing you monthly catchup posts full of brilliant book recommendations for older readers, as well as the odd review or two when a particular chapter book catches our eye and our hearts. 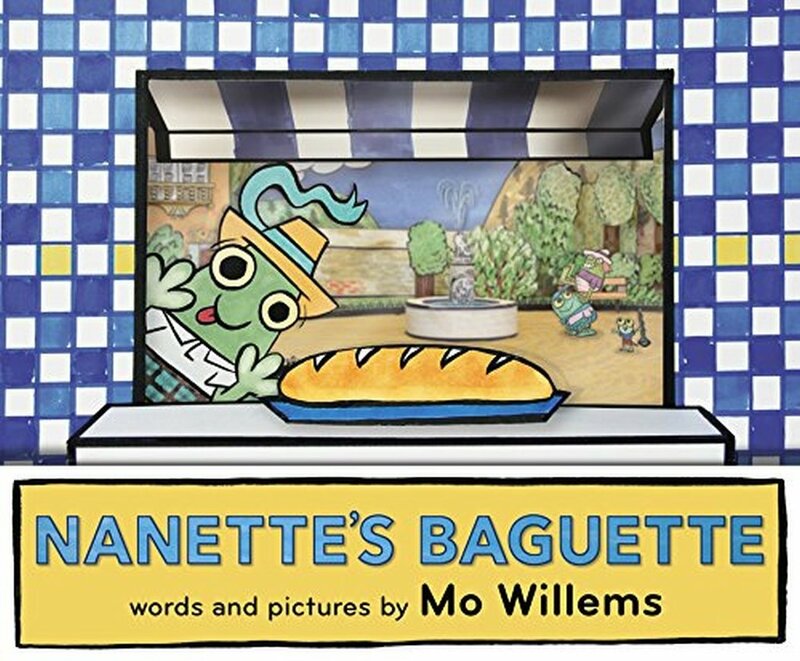 So we're kicking off with a book that instantly had Charlotte saying "that's ME!" Chris Higgins' "Trouble Next Door" (with illustrations from Emily MacKenzie) is bang on the nail for Charlotte's taste, being a hilarious slice of girlish life. Our hero Bella has just moved into a new house. It's old and dark and she's sure there's a ghost in the attic! But things look up when she meets her new next-door neighbour Magda. Magda is lots of fun! She's bubbly and full of imagination and can even turn cartwheels! It doesn't take long before the two neighbours become best friends. But Magda is, unfortunately, the sort of girl your mum warned you about! She breaks Bella's mum's best tea set, trashes Bella's room and covers the whole living room in soot. Worse than that, somehow Bella ends up getting the blame for everything. Is this new frenemy more trouble than she's worth? 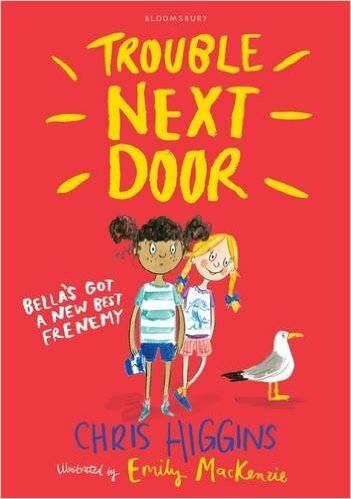 With tons of slapstick and comedy and a rather acutely observed slice of middle grade girl life captured perfectly within its covers, "Trouble Next Door" is a smasher! "Trouble Next Door" by Chris Higgins and Emily MacKenzie is out on 12th January 2017, published by Bloomsbury. Next, this one is really going to rock your world if you've ever dreamed of living in a bookshop. 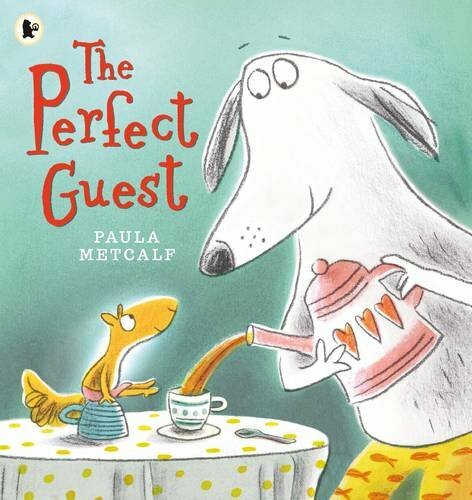 Sylvia Bishop's awesome "The Bookshop Girl" won us both over (and by now you'll have already seen it hit our Book of the Week slot), not just because it came with a free cup of tea (and there's no better way to review a book than with a free cuppa! We're still amazed they managed to mail it to us without spilling it!) but because it has one of the most original heroes you're likely to find in a book. Found in the shop’s lost property cupboard at five years old, Property Jones was never collected so now calls the Bookshop 'home'. 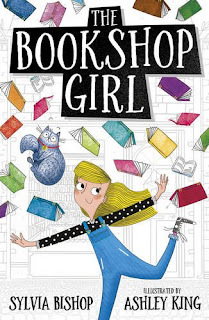 But when Property’s adopted bookshop family announce that they’ve won a competition, and that the prize is Montgomery’s Book Emporium – the most magical, most magnificent bookshop in the world! – Property realises that not all is as it seems. The bookshop may come with more books than they’ve ever dreamed of (as well as one extremely grumpy cat), but it also comes with a mystery to be solved. As far as Property is concerned, there's only one gal for the job! "The Bookshop Girl" by Sylvia Bishop is out on 2nd March 2017, published by Scholastic Books. Look out for a review around that time! 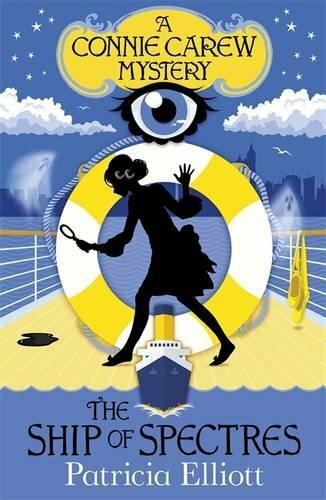 Patricia Elliott's spirited sleuth Connie Carew is back in Book two of the awesome girl detective series. It's far from the idyllic luxury cruise though, as there's trouble at sea. Someone is trying to harm the passengers. Why? Who has a grudge against whom? It's up to Connie to investigate the secrets of all the passengers as, mile by nautical mile, the ship sails ever closer towards disaster. Connie is a clever, witty and opinionated young detective, living at an exciting time - the early part of the 20th century when women were beginning to carve careers and lives of their own. As far as mighty girl heroes go, Connie sets a fantastic example for your own mighty girls and boys who will love her antics and of course her detective brain. "The Ship of Spectres - A Connie Carew Mystery" is out now, published by Hodder Children's Books. Pirates! We need some pirates next to compliment all that dastardliness at sea! 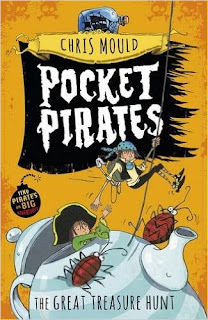 Chris Mould's awesome "Pocket Pirates" series is back with book four and "The Great Treasure Hunt". Our pint sized gallant band of heroes live in an old junk shop aboard a dusty ship in a bottle. When the world isn't watching, a tiny pirate crew comes out to explore. They're smaller than a teacup, but these scurvy sailors have a HUGE appetite for adventure! The Pocket Pirates have left the safety of their shelf to search for GOLD ... but dangers await them. The skirting-board mice are on the prowl, and the shopkeeper has an unwelcome surprise in store! Treasure hunting is a risky business when you're shorter than a Lego minifigure! 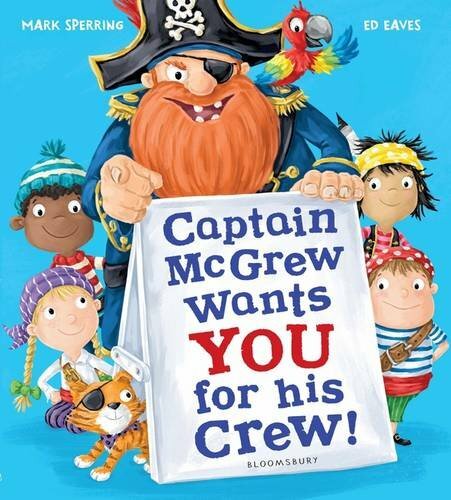 A fab pirate romp, illustrated throughout by Chris (who also illustrated the fantastic "The Boy Who Saved Christmas" by Matt Haig). 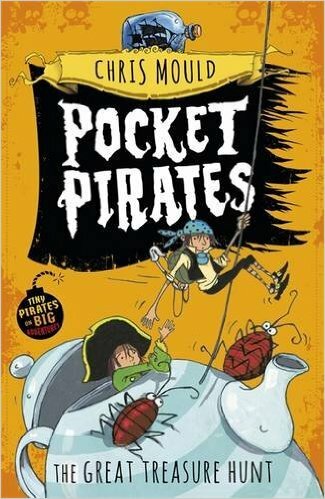 "Pocket Pirates Book 4: The Great Treasure Hunt" is out now, published by Hodder Children's Books. More detective fun next, penned by a famous celebrity and her sister. 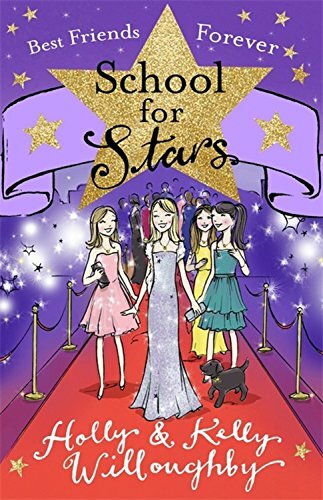 Holly and Kelly Willoughby's "School for Stars" series is now on book 8 (book 8!!! 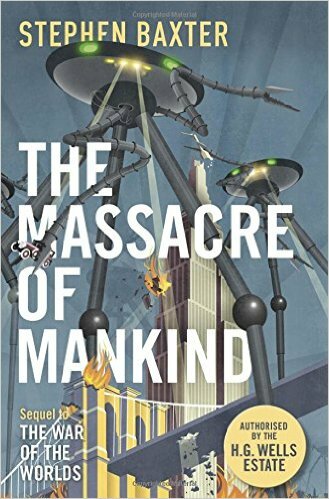 book 8, I had no idea they'd been so prolific!). In "Best Friends Forever", the final book in the series you can once again join schoolgirl detectives Molly, Maria, Pippa and Sally for more mystery and glamour in this adventure series set in a contemporary school for the Performing Arts. Twin sisters Molly and Maria are first class detectives with a flair for uncovering adventure - there's no mystery too big for the Fitzfoster duo. But, alongside their crafty clue-hunting, there's also the small matter of a school camping trip in the big outdoors. The girls are ready to roll up their sleeves but nothing could prepare the friends for what awaits them en France . . . I let Charlotte loose on this one and she gave it a very firm thumbs up, perfect for her age group and interests with enough glitz, glamour and sparkle for princessy girls too. 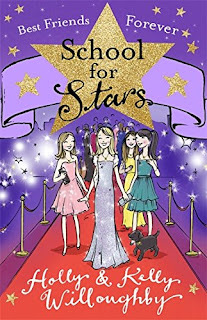 "School for Stars - Best Friends Forever" by Holly and Kelly Willoughby is out now, published by Orion Children's Books. 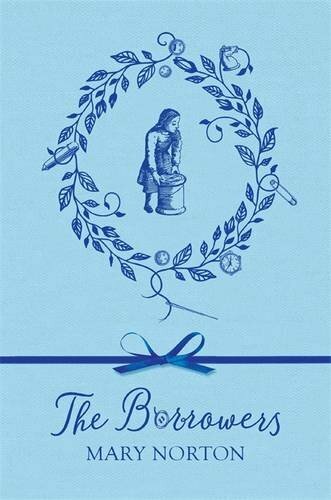 Mary Norton's timeless "The Borrowers" is one of those books that everyone should have in their collection. The brilliantly original story of wee folk that live in the house and 'borrow' certain objects (only borrow mind, not steal!) has spawned a couple of movies and a TV series, and even a fantastic animated version from Studio Ghibli. But go straight to the source with the fantastic cloth-bound version new from Orion Publishing. Deep beneath the floorboards lives the tiny Borrower family - Pod, Homily and Arrietty Clock. Everything they have is borrowed from the humans above them; even their names are not quite their own. There is just one rule: they must never be seen. Then one day Arrietty accidentally meets the boy from above, and the family's incredible adventure begins. 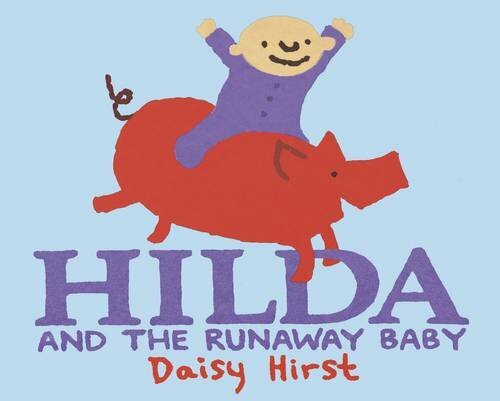 I remember reading this as a child, and being completely in love with the idea of the little folk. Charlotte loved the Borrowers through the movie versions (both live action and the gorgeous Ghibli version of the story) so it's been awesome to introduce the book to her. Children young and old are bound to love reading this one. 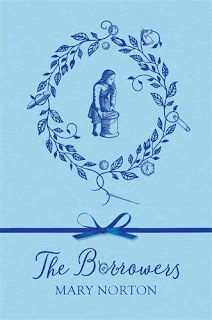 "The Borrowers" by Mary Norton is out now, published by Orion Children's Books. 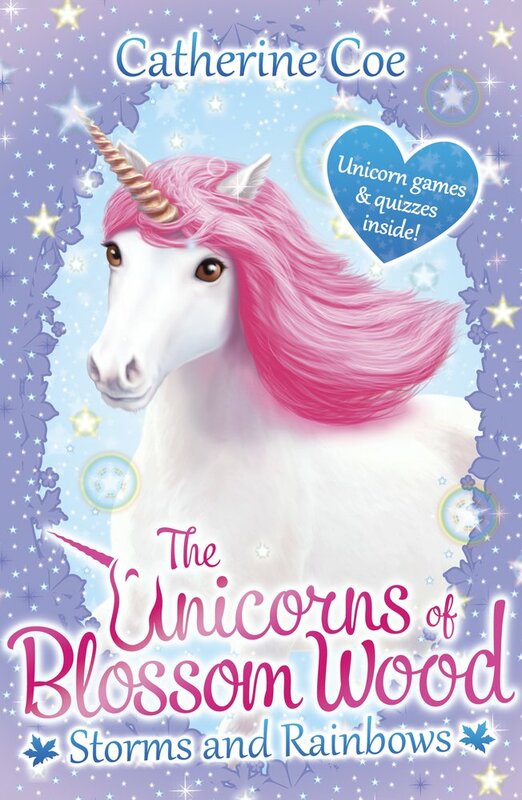 5th January saw the release of the next two books in Catherine Coe's awesome "The Unicorns of Blossom Wood" series. You've already seen our reviews of books 1 and two so now it's time to delve into "Storms and Rainbows" and "Best Friends" - both out on the same day. In "Storms and Rainbows" Cora, Isabelle and Lei arrive in Blossom Wood to bright sunshine. But moments later, a storm begins to rain down. Blossom Wood is being flooded and the animals need their help. The only problem is, Lei still doesn't know what her unicorn magic is! Can the Unicorns of Blossom Wood come to the rescue? In "Best Friends", Lei, Isabelle and Cora once again return to their favourite magical place. Once back in Blossom Wood for another adventure they find that their friend Loulou the squirrel is organizing a talent show for all the animals. The three cousins can't wait to help, but what's the matter with Loulou? 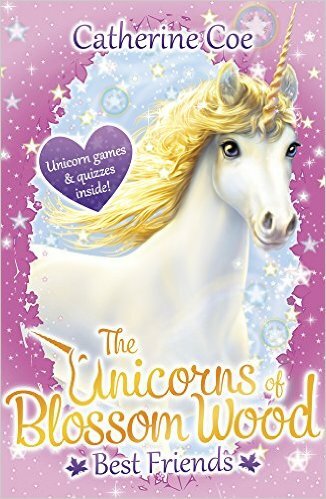 Can the Unicorns of Blossom Wood use their special powers to make Loulou happy again? 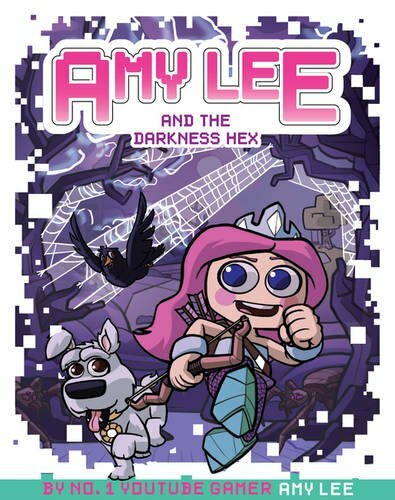 Girls will love these adventures, full of magic and sparkles and there are lots of games and quizzes in each book in the series. Complete your "Unicorns of Blossom Wood" collection with the two latest titles, written by Catherine Coe and published by Scholastic - and out now! 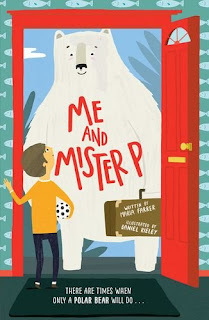 "Me and Mister P" by Maria Farrer, with illustrations by Daniel Rieley is newly published by OUP and tells the story of a rather unexpected arrival. Young Arthur is fed up. He's got a completely bizarre family, a brother from weirdsville and now a gigantic polar bear is standing on the doorstep, suitcase in hand, expecting to come and stay for a while. What on earth would you do? This is how Arthur meets Mister P - the world's most helpful polar bear! Mister P could well be the answer to all Arthur's prayers, or a complete nightmare in bear form. Eeek! The unlikely pair form a strong friendship, and sometimes there are times when only a polar bear will do! 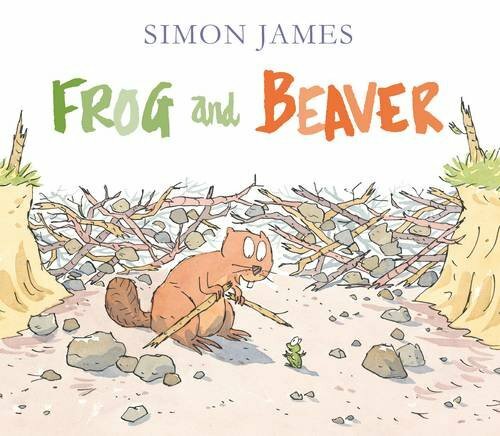 Chock full of brilliant energetic illustrations, this is a funny and heartwarming tale of a very strange friendship. "Me and Mister P" by Maria Farrer and Daniel Rieley is out now, published by Oxford Children's Books / OUP. 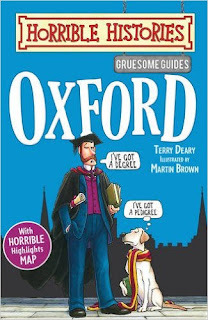 Sticking with OUP for a moment, another January publication that is very far from cute, cuddly and friendly. More like fiendly in fact! In Hacker Murphy's "The Creeper Files - The Root of all Evil" with illustrations by Lucie Ebrey you'll meet ace investigator Hacker Murphy, curator of"The Creeper Files", detailing the nefarious activities of the most evil man/plant ever known. Young Jake has a problem. There's something crazy and evil on the loose in his garden. Jake's dog knows there's a problem: there's no way he's venturing outside on his own. Jake's friends know there's a problem: who exactly is the strange entity lurking in their back gardens too? Jake's mum has no idea there's a problem: she's a grown-up, you know what they're like. Careful of what is growing beneath the soil, you'll never look at a plant (or a watering can) the same way ever again! A perfect adventure romp and detective series kicks off in January. 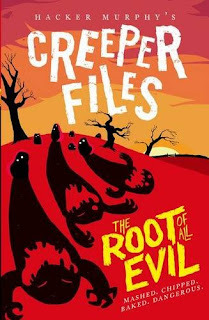 "The Creeper Files: The Root of All Evil" by Hacker Murphy and Lucie Ebrey is out now, published by Oxford Children's Books / OUP. So what's next lurking at the bottom of our book bag? 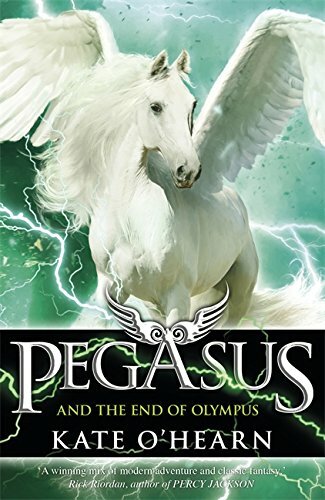 Kate O'Hearn's fantastic "Pegasus" series reaches its conclusion with book 6 - "Pegasus and the End of Olympus". As you can probably tell from the title, the series draws to a cataclysmic close as Emily must once again return to earth to fulfil an ancient promise. When she arrives, she is horrified to find that the nefarious CRU have taken more victims. Emily has to investigate the nature of the CRU, uncovering a secret that once again leads her back to Titus and a final confrontation with Saturn that may be her last desperate act. Likened to the "Percy Jackson" series, "Pegasus" similarly taps into ancient Greek mythology for an exciting and contemporary fantasy series with tons of excitement and adventure. Emily is a mighty girl to be reckoned with! 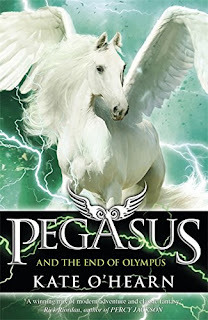 "Pegasus and the End of Olympus" by Kate O'Hearn is out now, published by Hodder Children's Books. 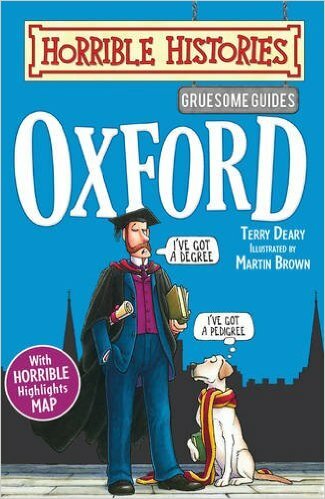 You can also catch up with the previous books in the series, also published by Hodder. With the huge surge in popularity of fantasy role playing games, there's never been a better time to dive into a brilliant fantasy series that'll appeal to all Dungeons and Dragons nuts. 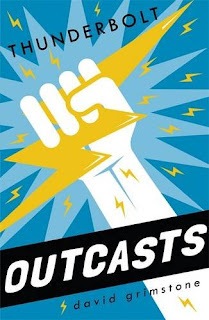 David Grimstone's awesome "Outcasts" series picks up with Book 2 - "Thunderbolt" (following on from previous volume "The Game"). Jake (Dealmo) and his friends Kellogg, Lemon and Fatyak love nothing better than hurling the bones playing role playing games. But their board-based adventures are about to 'get real' in the most incredible way. But will their superpowers be enough to win the battle ... and tame the storm? If your kids are looking for a fantastic new fantasy series, look no further. Tight writing and interesting characters and situations make for a brilliant frenetic read. "Outcasts Book 2: Thunderbolt" by David Grimstone is out now, published by Hodder Children's Books. "River of Ink - Genesis" (Book 1) by Helen Dennis is joined by "Zenith" (book 2) and now "Mortal" (book 3) continuing the illustrated narrative and high adventure of the series to date. Once again we join Jed and Kassia on a frenzied flight across the world. Jed's life is in danger, he has exactly one year to complete a perilous quest or he will die. If he somehow manages to unravel his own mysterious past, he may join the immortals and live forever. Now the friends know that Jed is the key to solving the mystery, the two flee to Istanbul to hunt for more clues, with deadly pursuers intent on stopping them at all costs. 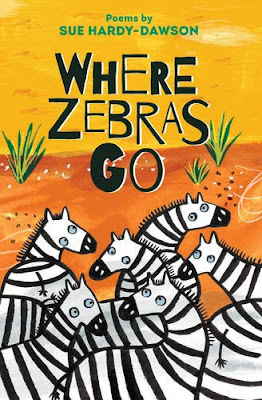 The third in an action-packed series full of adventure, this book has an illustrated narrative running through it, helping readers to solve the mystery alongside the characters in the story. 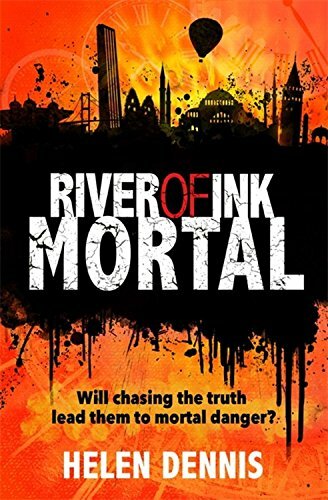 "River of Ink - Mortal" by Helen Dennis is out now, published by Hodder Children's Books. YAY! The return of a fantastic hero next, and the follow-up to a book we both really enjoyed! 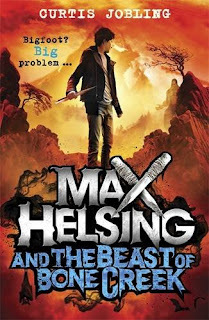 Curtis Jobling's teen hero Max Helsing is back, with a new beast to deal with. "Max Helsing and the Beast of Bone Creek" pits the would-be monster slayer against a new foe, as his holiday camping trip to Bone Creek goes downhill fast. Trouble starts brewing when a slew of mysterious murders have Bigfoot hunters lining up, guns at the ready, itching to confront "The Beast". Max's old enemy Abel Archer has also rolled into town, adamant that he's going to be the one to take the beast down. But the appearance of dire wolves and vampires complicate matters - who is really responsible for the murders? With the help of his friends, it's up to Max to find the culprit before the wrong suspect ends up as a trophy on a monster hunter's wall! Wildly exciting and original, like a cross between The X-Files, Buffy the Vampire Slayer and Percy Jackson, this is going to rock your world if you're into monsters, myths and mysteries! "Max Helsing and the Beast of Bone Creek" by Curtis Jobling is out now, published by Orchard Books. 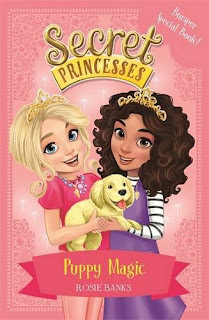 Book 5 in Rosie Banks' "Secret Princesses" series is out, and this time they've brought puppies! The animal-loving Secret Princess trainees, Charlotte and Mia, have to help Princess Ella get her wand back by granting four animal-related wishes. Can they help Tessa complete puppy obedience school so that she can take her puppy on holiday with her family? Or will Princess Poison and her pet, Crusher, spoil everything? A special bumper length book that's actually not a bad starting point for new readers to the series who want to find out all about the magical world of the Secret Princesses. 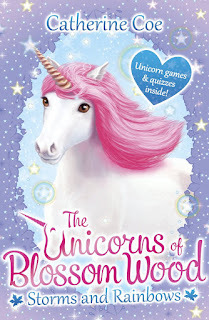 "Secret Princesses - Puppy Magic" by Rosie Banks is out now, published by Orchard Publishing. 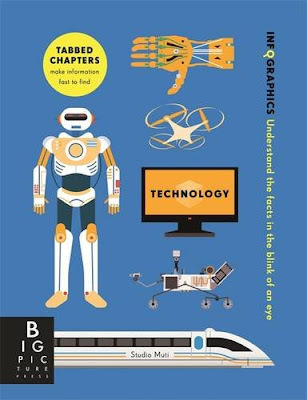 Finally, this one arrived with exquisite timing for our Chapter Book Roundup - as it's out today! 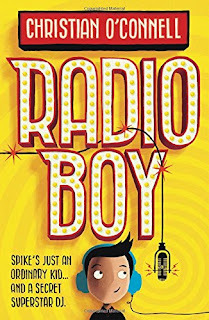 Joining the hallowed ranks of comedy writers who are turning their hand to writing children's books, Christian O'Connell's "Radio Boy" introduces Spike, an ordinary everyday kid who just happens to be a secret superstar DJ. All is not well in Spike's world though - he becomes the first presenter ever to be sacked from hospital radio but radio stardom is addictive, so Spike decides to carry on from a makeshift studio in the garden shed. 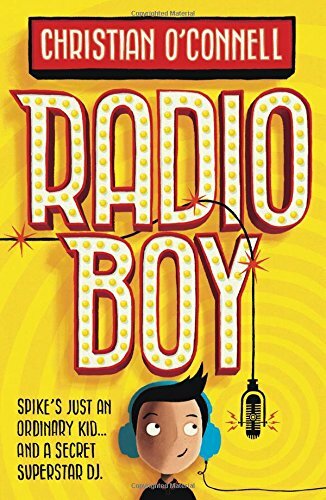 With the help of his best friends Artie and Holly, Spike becomes Radio Boy, disguising his voice and becoming a huge sensation as word gets round. Soon Spike's motormouth gets him into trouble once again, and now the hunt is on for the mysterious Radio Boy! Can Spike remain anonymous? Will he get to marry the girl of his dreams, Katherine Hamilton? Will he become famous and popular? The answer to most of these questions is no…but the answer to whether this is a hugely entertaining, funny and original book is a resounding YES! "Radio Boy" by Christian O'Connell with art by Rob Biddulph is out today, published by HarperCollins Children's Books. Rachel Renee Russell, fantastic author of "Dork Diaries" - a series that Charlotte absolutely loves to bits has a new dorky hero, this time it's a boy! 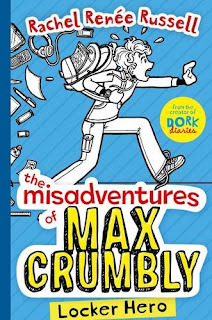 "The Misadventures of Max Crumbly Locker Hero" sets the tone for a series of completely chaotic new stories featuring Max. After being homeschooled by his Grandmother, Max is finally heading to 'real' school for the first time. But before long he’s starting to question that choice with the Doug aka Thug Thurston Problem. As in, Thug keeps stuffing Max in his locker! This never happened at Grandma's! If only Max could be like the hero in all the comics he likes to read – or the ones he draws – and magically escape the locker and defeat Thug. Unfortunately, Max’s uncanny, almost superhuman ability to smell pizza from a block away won’t exactly save any lives or foil bad guys. But that doesn’t mean Max won’t do his best to be the hero his school needs! Rachel's writing is as entertaining as ever, and judging by the amount of time Charlotte has spent reading (and re-reading) this one, I think she's got another huge hit on her hands. 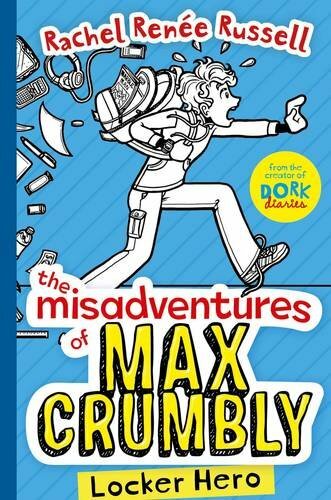 "The Misadventures of Max Crumbly" by Rachel Renee Russell is out now, published by Simon and Schuster Children's Books. We'll be back next month with another chapter book roundup - in the meantime, if you're still hungry for more, catch up with our February Podcast and regular "Chapter Book of the Week" slots throughout the rest of 2017. Happy reading! Aw, we got our hopes up for a moment that there was a new Luke Pearson "Hilda" book in the offing but don't worry, this little piggy is just as awesome...! 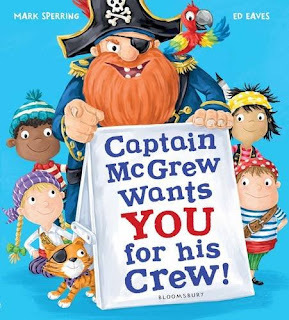 Pirates still seem to be the bearded ne'er do well of choice for many, many kids - both girls and boys so it's time to splice the mainbrace once more with a yo ho ho...! 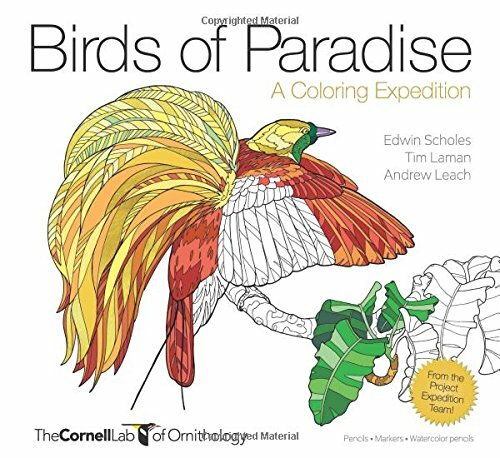 Time for more colouring fun, slightly different to the Birds of Paradise but something we're still hopelessly geeky and gushy about. The World of Harry Potter has definitely made a huge impact on Charlotte's reading and she also loves the movies too (well, the ones we'll let her watch - the latter ones are still a bit too dark in tone for her). 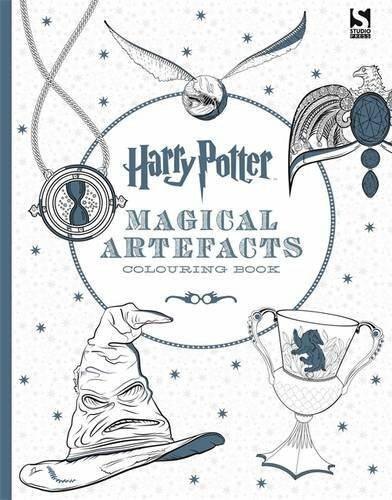 We also love Studio Press's range of fantastic colouring books, drawing on the Wizarding World and the amazing characters and objects therein. "Magical Artefacts" as you've probably guessed draws together some of the incredible items and props that featured in the books and movies. 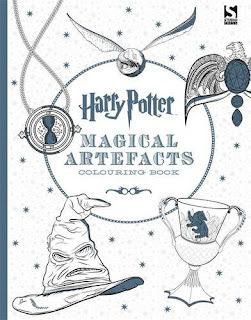 Everything from the Sorting Hat to the Golden Snitch, the Time Turner and of course all those fabulous Weasley's Wizard Wheezes products are featured in this colouring book, alongside designs and colour plates drawn from production and pre-production art for the movies themselves. You don't need a magic wand for this one, just a whole stack of colours - so get cracking and enjoy fantastic colouring fun! Kids who were hooked on both Planet Earth and Planet Earth II couldn't fail to have been won over by the many birds of paradise that (thankfully) still live in the forests and jungles of our amazing planet. Apologies for skipping a week but we're back on track with our ReadItTorial slot, once again dipping into a subject that we've visited and revisited many times on the blog. Dark books for children. Inspired by "A Series of Unfortunate Events" (possibly one of the most successful "dark" children's book series ever) getting a new small-screen treatment as a Netflix series (it's very good by the way, go watch it!) I've definitely noticed that as Charlotte gets older, she has lost some of her love for darker stories, nasty characters and perilous settings. When we started this blog and she was a tiny little thing, I'd often grab some of the darker children's books from the library along with the usual happy-go-lucky haul. I think this is something that some parents are predisposed to, particularly if they like darker subjects and stories themselves and can't resist a cracking villain. Obviously everything we covered early on had to be tried and tested first before being deemed as fit for consumption by tiny eyes, but soon I realised she actually liked the odd jump-scare, and the 'baddies' were often the most interesting characters in those books. 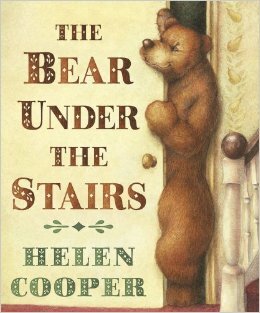 On the one hand it's a book about a little boy's over-active imagination and fear of the dark cupboard under the stairs, and the bear he believes live there. 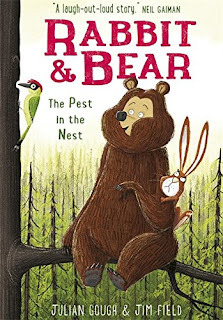 On the other hand it's a book that expertly and very visually describes exactly what it feels like to be a child, at that age where pretty much anything still feels possible and plausible, and even the most innocent old fur rug tucked under the stairs can look like something altogether more menacing. 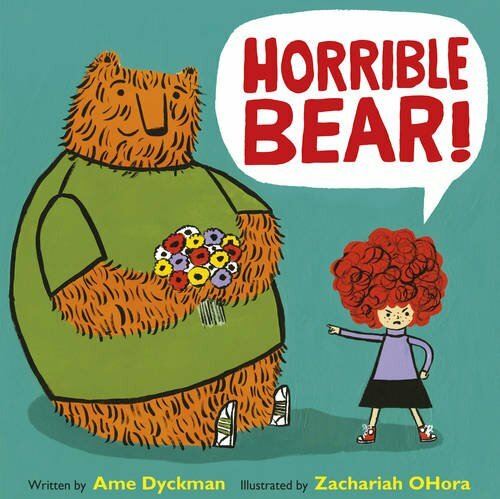 The first time we read this book together it gave Charlotte nightmares and that was pretty much reflected in our first review. Weirdly though, she came back to it and demanded we borrowed it from the library (we've since added it to our collection, just because it's such a fantastic book). 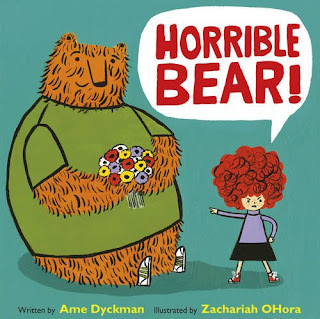 Almost like she LIKED being scared by it but once she'd got over the initial way the book worked on her, she began to really love Bear. Back when she was very tiny, I hadn't the foggiest idea what being a dad was all about. I fell into the same traps I'm sure many new dads (and quite a few new mums) do of not quite thinking things through before launching into them. I developed a very gruff gravelly voice for Bear even though he doesn't actually have any 'spoken' lines in the book. I'd add these little comic asides to describe his actions, fitting them alongside William's own story in the tale. Stupidly I think these probably made the whole book feel more menacing than it actually was but it's interesting to see other folk's opinions on this one, not feeling that it's a dark book at all. But it does work on a child subconsciously, and I think that's perhaps why later on children lose the ability to pass something off as merely being in someone's imagination, and pick up more on emotions and feelings of characters who are quite obviously in distress. 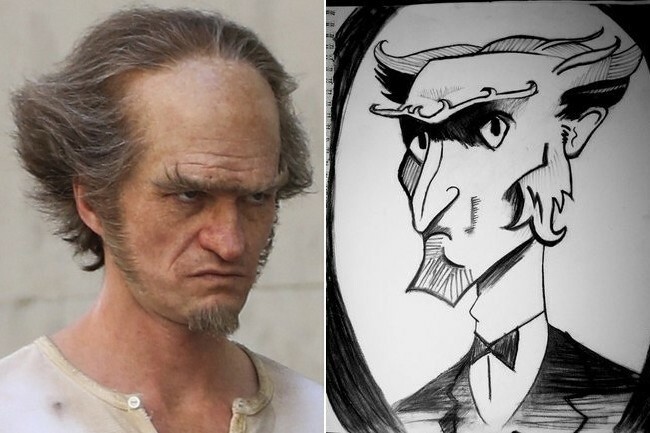 Going back to "A Series of Unfortunate Events" I wondered how the TV show would deal with a moment that underlines exactly what a complete b*****d Count Olaf actually is. Early on in the book when Klaus, Sunny and Violet have dutifully cooked dinner for The Count and his awful acting troupe / band of henchmen, Klaus says something particularly smart back at Count Olaf, and receives a ringing smack around the face for doing so. The slap is something that would rule out me letting Charlotte watch this show, and it's something we gently skipped over in the books (I'm pretty sure many parents "abridge" books to read around bits they know are unsuitable for their younglings, right?) but it is a pivotal part of building Olaf's character up to be exactly what it is, a dark villain that should not be trusted an inch. As I get older, and thanks to a good dose of sensibility from my wife, I find I'm getting more touchy and sensitive about darker books myself - well, for Charlotte's consumption at least. 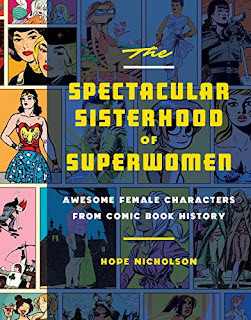 Now and again we vet chapter books that we know would probably disturb her during before-bed reading but it's so very tough to do this when you've very little indication of a book's content if it's A) brand new and B) all you've got to go on is a very short summary. Of course, 'dark books' are the darlings of the press who love to point out that as children become ever-more desensitised to horrible people and horrific events, authors and illustrators of dark stuff have to up their game until they're treading firmly on the toes of subjects and characters that would make many adults wince. 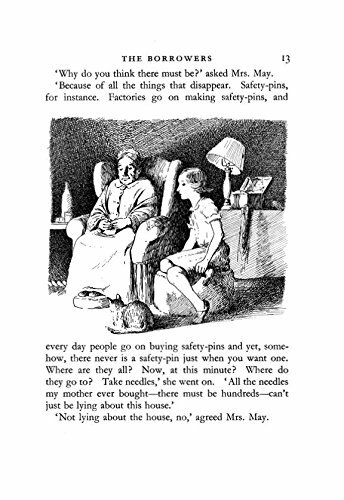 Are we rapidly approaching a point where dark books are a quaint thing of the past because kids have seen it all before by the time they reach the tender age of taking their own first faltering reading steps on their own? We're delighted to see a further two new titles added to the fantastic and inspirational "Little people, Big Dreams" series from Frances Lincoln Children's Books and author Isabel Sanchez Vegara. First, we meet one of the world's most famous mystery writers, a lady whose books have sold by the squillion and have inspired many movies and TV adaptations as well as many writers to take up their pen for the first time. 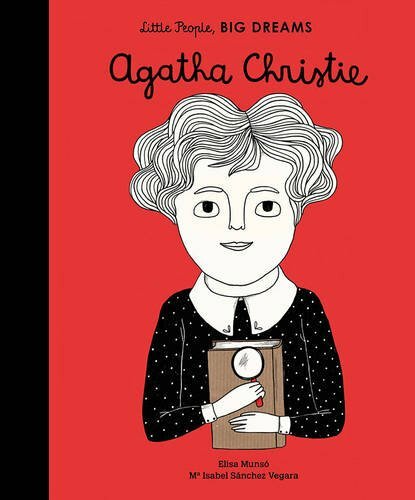 "Little People, Big Dreams: Agatha Christie" (with illustrations by Elisa Munso and translation by Emma Martinez) chronicles the early life of young Agatha, an inquisitive child with a nose for a mystery. A self-taught reader who started voraciously consuming books at the age of 5, she was destined to always find a love of literature. After serving as a nurse during the war, Agatha returned to civilian life and began to write her first novels, dreaming up amazing characters such as Hercules Poirot and Miss Marple. Gloriously illustrated throughout, the book features more of Agatha's amazing life story at the back of the book for further reading, and lots of great recommendations of other places to find out about this lady's amazing life. "Little People, Big Dreams" is released on 2nd March 2017, published by Frances Lincoln Children's Books. 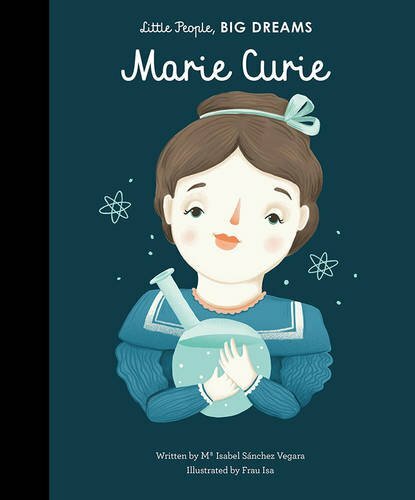 Also out on the 2nd March is "Little People, Big Dreams: Marie Curie"
Once again written by Isabel Sanchez Vegara, this time illustrated by Frau Isa with translation by Raquel Pitt, we meet one of the most fascinating and accomplished women scientists of the last 200 years. Marie Curie, a hugely important pioneer in the world of medicine, chemistry and physics. Mme Curie won several Nobel Prizes for her discovery of Radium and Polonium, and their use in the fight against cancer. Along with her husband Pierre, Marie Curie's thirst for knowledge and amazing discoveries have ensured that many, many lives have been saved through her pioneering techniques, offering a hugely inspirational figure for young scientists to look up to and learn from. As with the Agatha Christie title, there are even more facts about Marie Curie's amazing life tucked into the back of the book. One of history's greatest scientists without a doubt. "Little People Big Dreams: Marie Curie" is also released on 2nd March 2017, published by Frances Lincoln Children's Books". 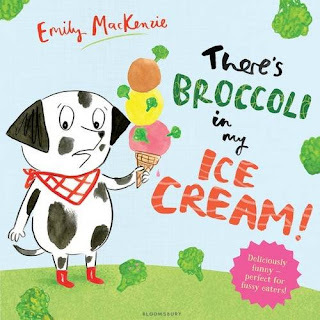 Here's a picture book that may just help with your finicky fussy little eaters from the author-illustrator of "Wanted: Ralfy Rabbit"...Ready to eat your greens? Uh-oh! Someone's having a bad day, a day that starts with a kite...and a bear! Two new paperbacks to warm your winter cockles - "Lucy Ladybird" and "Lionheart"
It's cold, wet and rainy but look forward to the sunnier weather with two bright and dazzling new titles releasing as paperbacks this winter. 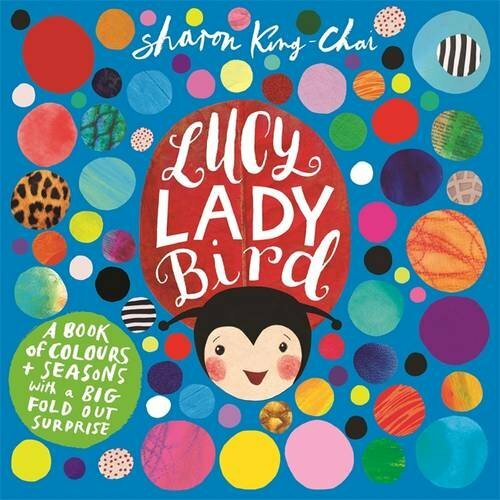 First out of the gate is a reprint of Sharon King-Chai's gorgeously colourful "Lucy Ladybird", published by Templar Publishing. 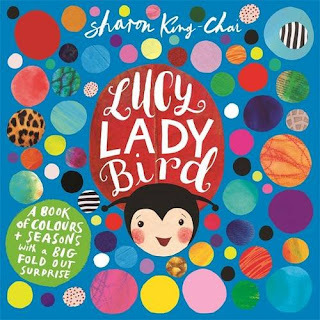 Lucy is a carefree and happy little insect, but when she loses her spots, it's time for an epic quest through the seasons meeting lots of friendly folk on her travels who all contribute colourful spots of their own for Lucy's collection. She does look different to other ladybirds, but different is cool - and soon all the other ladybirds want their own fantastic colourful spots too! 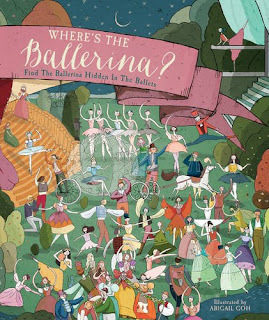 A lovely little read, absolutely perfect for younger children and packed with amazing colour and design. "Lucy Ladybird" is re-released now, with this latest edition published on 12th January by Templar (and kindly sent for review). You can find our original review here. 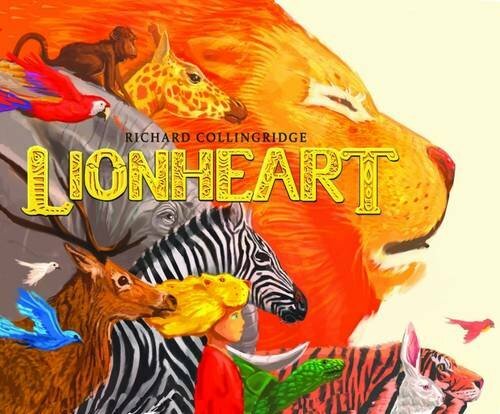 The story starts with a little boy named Richard who is playing in his room, cuddling his favourite cuddly Lion toy. But something is there and Richard is scared, so he runs ...through streets, fields, forests, over hills and into a magical jungle. Is there really anything there? And is he brave enough to face his fears? Can be become a true Lionheart? Find out in this exciting and uplifting adventure that will make you want to ROAR out loud along with the story. This one was a well deserved "Book of the Week" back in 2016 and it's now released in paperback with an utterly fantastic new cover. One for animal fans, "Lionheart" by Richard Collingridge is out in paperback on 2nd February 2017, published by David Fickling Books (and kindly sent for review). Making new friends can be quite hard, but some folk's exuberance and effervescence can end up making them just a tiny bit...annoying! Rabbit and Bear - two friends who are like chalk and cheese! Join us for book two in this fantastically funny series!